Rockhopper returned today and a new pin was released. Rockhopper has brought us only one new item this time, the Swashbuckler Outfit! Mabye next time? The new pin is a Puffle O’berry and is located at the berg! Club Penguin came out with a new newspaper today, in focus is Rockhopper! Club Penguin will be having its first annual sculpting contest. To enter, draw a picture of an ice sculpture on your computer or by hand. Then put it on your computer and save it as a .jpg file! Then, go to page A6 of the paper and submit it. The top ten finishers will earn 10,000 coins. Now for the current events. Coming to Club Penguin on Friday, February 27, 2009. Rockhopper returns with Yarr and a new pin is hidden. Coming to Club Penguin March 6, 2009 is the March Clothing Catalog. Coming to Club Penguin March 13, 2009 is the Saint Patricks Day Party and a new pin! Coming to Club Penguin March 20, 2009 is an all new stage. There are many new things today, including a party, and a new catalog! The Puffle Bandana is the free item and it can be found at the Cove! The other puffle party update that is here to stay is all the puffles have new moves! Each puffle has a room for it. Black Puffle – Pet Shop. There is a really cool room that was opened up for the puffle party that is available to both non – members and members! Here are the cheats on how to get to the room. 1. Go to the Snow Forts, you will see a Puffle Feeding sign, click on it. 2. You are now in the Puffle Feeding room! Club Penguin has came out with a new furniture catalog today, and there are three hidden items! 1. Click on the Pinata to get the Aquariam. 2. Click on the Snow Fort to get the Green Birdhouse! 3. Click on the Velvet Rope to get the Welcome Mat! Club Penguin also announced that Rockhopper will be returning on the 27th! He is currently visible through the telescope at the Beacon. The white puffle appears every 30 minutes. The newspaper says they could be hiding all over Club Penguin. I have spotted a white puffle at the Ski Hill. Club Penguin came out with a numerous cool new things today! At the Town, Plaza, and Ski Village, there are banners that are hanging and boxes of things that are lying around all for one purpose, the puffle party. The new pin is a box of Puffle O’s and can be found at the mine! Club Penguin returned the Sports Stage today. There are new items in the costume trunk, log on to Club Penguin to find out what they are! and if you click on the red ball Eric the red is holding you get a viking helmet…what the?! Club Penguin came out with a new newspaper today, whats in focus today is…. PUFFLES! The entire Penguin Times is about the puffle party coming on the 20th and the puffle furniture catalog coming out tomorrow! Now for the current events. On Friday, the thirteenth of February, puffles will start to play more with there furniture, and a new Puffle Furniture catalog will be released! who says friday the thirteenth is unlucky? On February 20, 2008, the Puffle Party will begin and a new Better Igloos catalog will be released. Hey! Club Penguin launched thier French servers! Now the total languages are 3. English, Portuguese, and French! There are only 3 servers total! Here’s a look! Club Penguin came out with a new clothing catalog today! The hidden items will follow. Click on the “S” in “T-Shirts” to get the Spikester. Click on the flower pot to get the Red Viking Helmet. Open and close the red viking helmet 4 times to get the Blue Viking Helmet! Click on the Disco Light to get the Fruit Headdress. Finally, click on the snowman’s head to get the Yellow Scarf. Have you ever wondered how items were made on Club Penguin? Check this out! Step 1: Decide. Usually, items are related to what events are happening that month, or where it will be used (like the costumes in the Costume Trunk). Step 2: Design it. 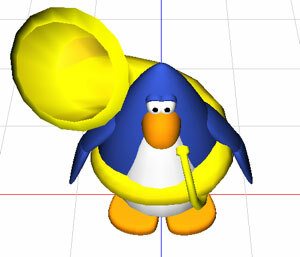 A rough drawing is made of what we think the item should look like (in this case, a tuba). Step 3: A final drawing is made. This is a clean-up of the rough drawing, with detail, color, and shading added. The icon is also made (this is the drawing of the item that’s in your inventory). Step 4: The clothing item is then made in 3D. The item is then complete! 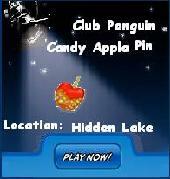 The sneak peek is of the puffle party which will be released Febraury 20, 2009. According to Billybob, there will be many more new puffle items released that will have to do with this party!